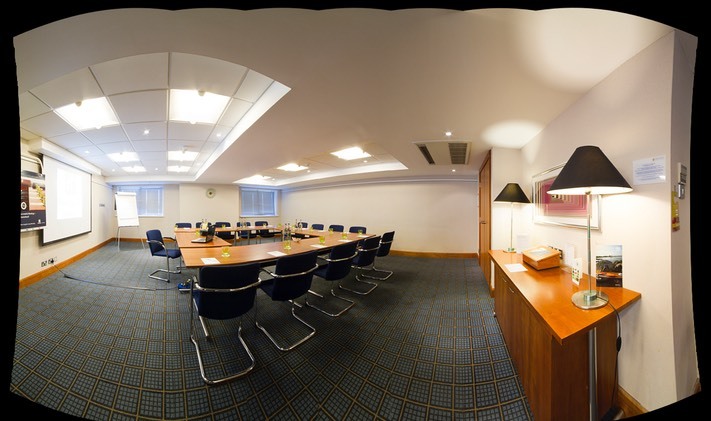 We were commissioned by the Holiday Inn Cambridge to photograph their Business Centre and adjacent areas in rotational panoramic format for their website refresh. The photos are taken using a special 'nodal point' camera bracket, (click here to see what we used) so the camera lens always rotates about its centreline, thus ensuring no misalignment in the fully processed photos, particularly where verticals are close to the lens. It is worth spending considerable time setting up the 'nodal point' using parallax indicators, as this will virtually eliminate the post processing corrections. Below are the stitched files, producing one large, flat image, but with the strange curvy shapes. These shapes allow it to be viewed as a continuous 360 degree rotational photo using additional software (not yet on this site), but they do illustrate how the process is constructed.